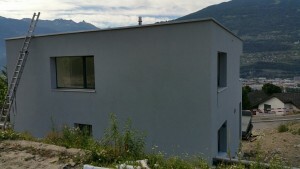 The first Biosolar roof in Valais Switzerland is a private villa new built on the south side of Sion. The owners were completely open to a new ecological approach of greening a flat roof in combination with solar thermal panels. Their original plan for the house had not included any green roofs. 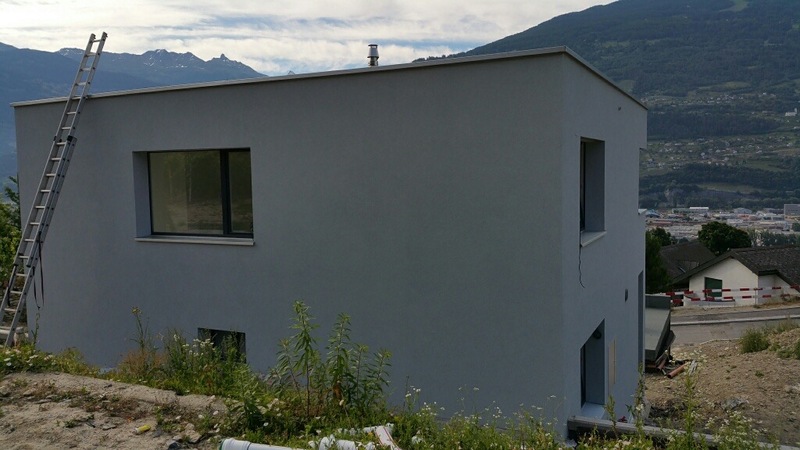 Thanks to the designers who knew about the ACCLIMATISATION project and were incontact with the Green Infrastructure Consultancy (CH), they persuaded the owners to choose a Biosolar roof approach. The Canton of Valais is one of the 26 cantons of Switzerland, situated in the southwestern part of the country, around the valley of the Rhône from its headwaters to Lake Geneva, separating the Pennine Alps from the Bernese Alps. The canton is simultaneously one of the driest regions of Switzerland in its central Rhône valley and among the wettest, having large amounts of snow and rain up on the highest peaks found in Switzerland. The first challenge was to locate a good local substrate – because of the extreme climate in the region. 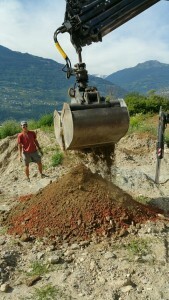 At the final mixture consisted of sub soil (soil excavated from the site). This subsoil also consists of small pieces of slate like rock. To this was added a mixture of gravel/crushed bricks. 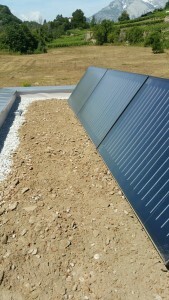 The design of the green roof consists of dry gravel river bed channels spread over the surface. 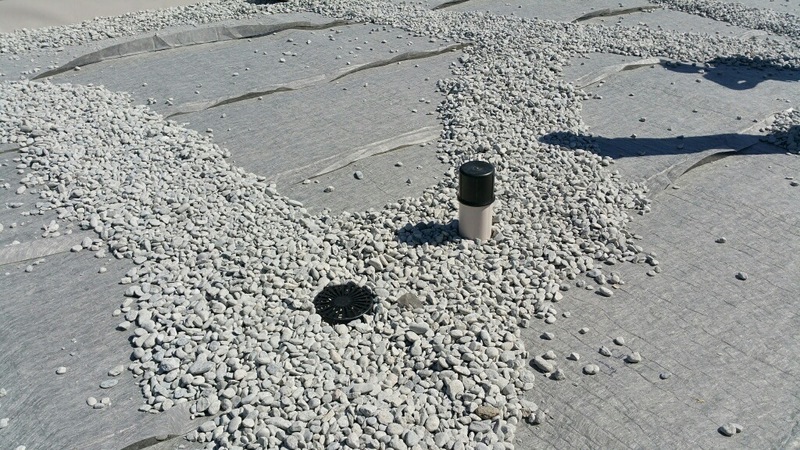 This lead to the water outlets allowing free movement of water across the roof. This principle is based on an approach used in the UK. 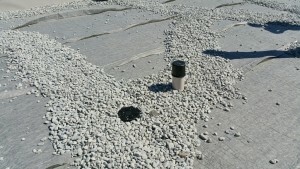 Between these drainage channels the substrate mix was laid at varying depths between 100 – 250cm. This type of topography replicates the habitat characteristics of glacial floodplains, which Sion sits within. The plant associations will be chosen according to the substrate types, heights and exposures. 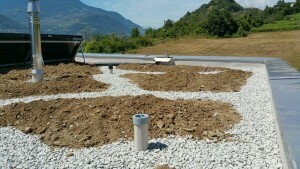 a Swiss green roof technique hay mulch technique (“fleur de foin”) will be spread in some areas. The hay mulch technique is a Swiss innovation known as “fleur de foin”. In this instance the hay will be collected from subalpine drought-tolerant meadows, where the plants are likely to be conditioned to the stresses that will be found on the green roof. This type of meadow is very special and rare in the Valais region. 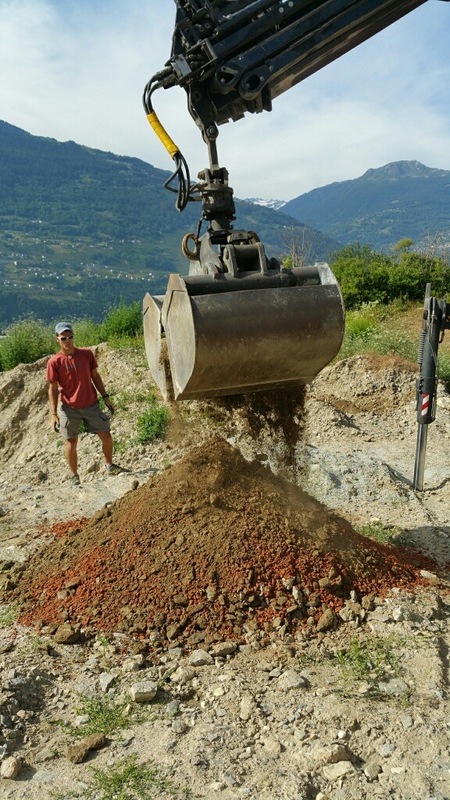 Over the coming years the vegetation will be surveyed to monitor how the planting techniques work and to come up with guidance on green roofs for this very dry area of Switzerland.